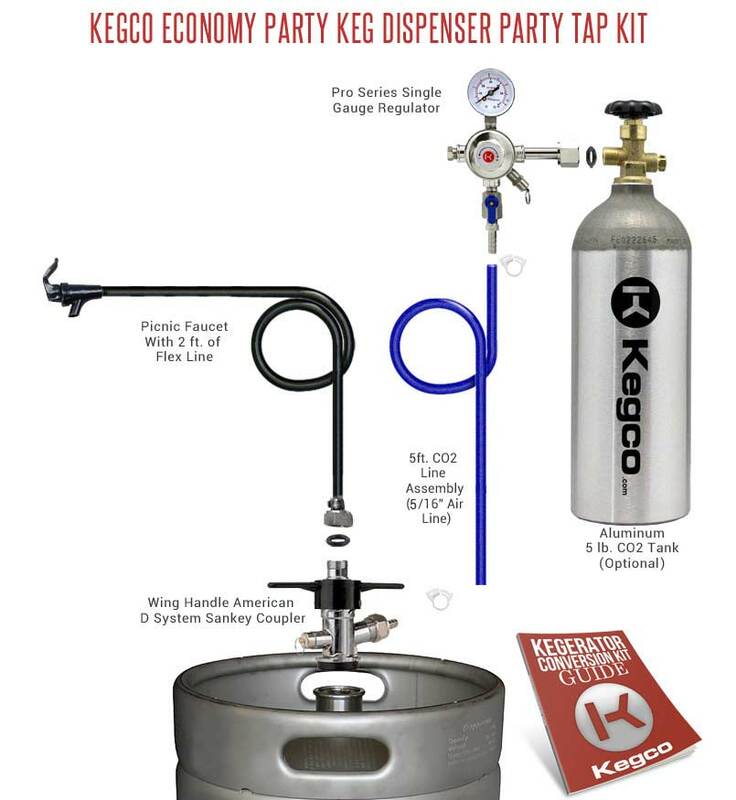 The Kegco E1PK Economy Party Keg Dispenser Party Tap Kit is ideal for beer lovers who want the convenience of a "no assembly required" party pump with all the superior performance features of a kegerator. All you need to put this kit to use is a refrigerator large enough to hold a full size keg, no shanks or towers need to be installed. This CO2 driven dispense system prevents your beer from going flat if you cannot drink it all in one night, so you can enjoy any left over beer long after your guests have gone home. Kegco's kits use only high quality commercial grade parts that have been designed and built to last, so you can trust that your party is in safe hands! The pro series regulator features an easy to read CO2 gauge that allows to to quickly see what your output pressure is set at and a large hand control that allows you to effortlessly adjust the pressure inside your keg. The regulator is constructed of chrome plated brass and features a manual pressure release valve as well as an integral tamper-proof safety pressure relief valve that releases at 45-psi. The coupler works with all domestic "D" system sankey kegs and is compatible with all domestic brand kegs.This keg tap features a 55-psi pressure relief valve and a nickel-plated forged brass body. The is a black plastic party pump squeeze faucet comes with two feet of black 3/16" I.D. beer line. This is the faucet you see installed on all picnic keg pumps. Party faucet comes with a hex nut assembly that will attach to the top of all standard commercial keg couplers for easy assembly.